Malcolm I, or Maelcoluim, the son of Donald II, succeeded to the throne in accordance with the tanist system on the death of his cousin Constantine II. He was seen as 'a valiant prince' and a lawgiver and was nicknamed "An Bodhbhdercc, "the Dangerous Red. Malcolm's reign commenced with an attempt to assert Scottish power over the area beyond the River Spey, where considerable parts of the country had long been subject to Viking rule. The kingdom of Northumbria in Northern England had for a long time been under the control of the Viking Princes of Dublin. They recieved support from the Cumbrians and the Picts of Galloway. King Edmund the Elder of England laid Cumbria waste in 945 and blinded two sons of Domnall mac Eógain, king of Strathclyde. 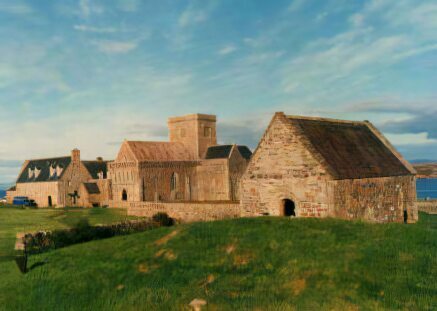 He granted Malcolm the lease of Strathclyde on his acknowledgement of Edmund as his overlord and on the understanding that Malcolm should give assistance to the English against the Vikings when required. In 946, King Edmund was succeeded by Edred as King of England. According to the Pictish chronicle, King Malcolm I was killed in the year 954 in the course of putting down an insurrection by the men of by the men of Moray lead by Cellach, at Kincardine on the banks of the river Forth, in the Mearns (Grampian) and was interred in the traditional burial ground of the Gaelic Kings of Scotland, on Iona. Malcolm was succeeded by his cousin King Indulf. His two sons Dub and Kenneth later ruled as Kings of Scotland.